What do you think Jesus looked like when he was a young boy? Was he like King David's son Absalom: perfect hair and perfect skin? Did he have a personality and smile that drew people around him? The Bible actually gives us a hint about what Jesus looked like in the book of Isaiah. These words were written many years before Jesus was born in Bethlehem. What? This is the Son of God? Couldn't God have made him have perfect hair, a perfect nose, a perfect athletic body, perfect ears, perfect eyes, etc. Sure, God could have made him look like that, but he didn't. Why? God chose, rather, to have Jesus look like the common, average, ordinary person. Do you ever feel common, average, and ordinary? If you do, be encouraged: Jesus chose to identify with you. Do you ever feel average and ordinary in your skills and abilities? God chose to have Jesus spend his boyhood as a common carpenter, a laborer. Perhaps you are one of those guys who could rarely ever hit a baseball far enough to get to first base, could never make a football spiral correctly when you threw it, couldn't make a soccer ball go straight, and always came in last in foot races. You were always the first to be dropped in spelling contests and the last to be picked for ball teams. Do your skills seem common and ordinary? If this is you, be encouraged: the gentle carpenter, Jesus, chose to identify with you. Do you sometimes feel out of place? Do you feel like a common sparrow in a world that was made for goldfinches, cardinals, bluebirds, and purple martins? People love purple martins. They buy expensive houses for them, and who can blame them. A purple martin can eat his weight in mosquitoes. Imagine having people that like you enough to buy you a house. However, those people don't buy houses for sparrows. They especially hate the English sparrow. The English sparrow can kill purple martins, often raiding their nests and destroying them, as well as the nests of bluebirds, chickadees, and wrens. In addition, they carry many diseases that are harmful to human beings. So some people buy special traps for English sparrows. Too small for purple martins, the traps have holes that allow the English sparrow to enter. But it's a death trap, once inside he can't get out. Without food, water, and fresh air, the sparrow quickly dies. Do you ever feel unloved like the common English sparrow? Yet, the Bible says that even when the sparrow falls, God sees him. During those times when you feel common, ordinary, unimportant, and unloved, God sees you too. In fact, he saw you before you were even born. Jesus knew what it was like to be unloved. In Isaiah 53:3 we read that Jesus was despised and rejected by men. Do you ever feel despised, rejected, and unloved? If so be encouraged: Jesus chose to identify with you. However, have there been times when you deserved to be despised and rejected? Maybe you've been rotten like the English sparrow. You've been spiteful and hateful. You've been unkind to your neighbor. None of that was hidden from God. God sees everything. He knows about every sin you've ever committed. Could Jesus love someone like you? Do you have anything to offer Jesus to make him love you? People are sad when the cat catches the goldfinch at the backyard feeder, but how many people mourn when the cat catches the sparrow? The goldfinch is a beautiful bird, but the sparrow is plain, common, ordinary, and sometimes vicious. By comparison, he has nothing to offer to make us love him and mourn for him. People are delighted when the bluebird finds one of their birdhouses, but they are enraged when an English sparrow takes over and kicks out the bluebirds. Bluebirds are colorful and pleasant, but English sparrows are common, ordinary, and destructive. It's no sin to be common and ordinary, but have you been destructive in the way you've treated others? Have you spent your days primarily concerned and consumed with your own interests? Unlike you, Jesus lived a perfect life. For thirty-three years he never sinned, not even once. Yet Jesus chose to identify with men in their sinfulness. How? Do you feel rotten and sinful? If so be encouraged: Jesus chose to identify with men by taking the punishment for their sins. Are you able to understand this? If you can comprehend how desperately you need Jesus, even if at this very moment you are dying in the deathtrap of sin, there is hope for you. Consider this story. 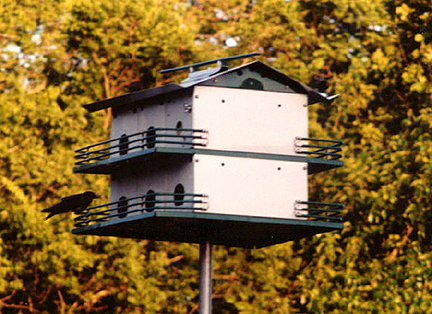 One day, an English sparrow invaded a purple martin house. He entered one of the compartments and killed all the young birds that were there. Not content with that, he entered one of the other compartments. Finding nothing inside, he turned to leave but couldn't. He was trapped. For hours, he thrashed around and threw himself violently against the entrance. It was a hot day, and without food and water, the bird finally collapsed. This happened to be one of the days the gardener checked for dead sparrows. Finding this one still alive, though barely, he decided to save him. Why did the gardener decide to save the sparrow? No one knew except the gardener. Gently, he placed the sparrow in a shoebox and took him inside his cottage. The bird was afraid of the gardener, but he was too weak to try to escape. Late at night, the bird listened helplessly while the gardener sang over him. The gardener was patient and gentle, so that eventually the sparrow learned to take food from his hand. Later, when he wasn't eating, the sparrow also enjoyed riding on the gardener's shoulder. However, the day finally came when the bird was fully recovered, and the gardener decided to set him free. He took him outside. Immediately the bird jumped from his shoulder and flew away. The sparrow was delighted to be out in the fresh air and to be able to use his wings again. However, when it got dark outside the bird missed the gardener. He returned to the gardener's window and perched himself on the outside ledge. When the gardener saw him, he opened the window and let him back inside. Again the gardener sang, and this time the sparrow tried to copy the gardener's song. From then on, the sparrow stayed close to the gardener. One day the owner of the estate came to visit. When he noticed the sparrow, he exclaimed to the gardener, "This is one of the most beautiful bird's I've ever seen, and what a delightful song he sings. Where did you find him?" "I found him in the death-chamber of the purple martin house," replied the gardener. "He was almost dead, but I was able to get to him in time." "Good work," responded the owner of the estate. "You always do good work." The gardener walked back inside. While riding on the gardener's shoulder, the sparrow noticed their reflection in a mirror. However, he thought that it must be some kind of trick mirror. He could see the gardener very clearly. But in the place where his own image should have been, there was another bird: bright, elegant, and more beautiful than he had ever seen. When the gardener sat down, he cradled the sparrow in his hands and sang, while the sparrow listened contentedly. Then the gardener smiled as he heard his own song being sung back to him, the gardener's song, sung by the sparrow he loved. Are you like this sparrow? You may feel common, ordinary, and unimportant. However, if Jesus were to walk up to you right now, he would know you by name. Are you caught in the deathtrap of sin? Has sin left you hungry, thirsty, and exhausted? Jesus is the divine gardener who can set you free. Hear the voice of the gentle gardener. Leave your sin behind and come to Jesus before it's too late.